Beautiful luxurious dessert...has some carbs 3 bananas so eat sparingly...but for 1 slice 2.5 grams of carbs and lot's of healthy fats. In a medium bowl beat butter, eggs, sweetener and salt together with a fork. Gather the dough into a ball, then pat and press into a 9" greased tart pan with rmovable bottom. Prick the dough with a fork. Bake for 8-10 minutes or until lightly brown. Let cool. Place the cream, the vanilla bean, the sweetener and the eggs yolks into a saucepan. Stir with a whisk until well combined. Add the cornstarch to water and whisk into the cream mixture. Cook stirring constantly until well thickened. Slice two of the bananas and place in a small bowl with lemon juice. 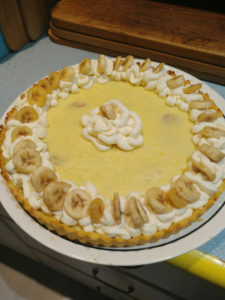 Arrange the banana sliices in a spiral pattern on the bottom of the tart crust. Pour the cream/pudding mixture over the bananas and smooth with a spoon. Add whipping cream to bowl of electric mixer and mix on high until whipped cream occurs - about 3 minjutes. Add vanilla and sweetener and mix until blended. Place whipped cream in a plastic zip lock bag (or pastry bag). Cut a tiny corner and squash the cream out in a decorative pattern around the edge of the cooled tart and the center as pictured. Slice the last banana and place in the lemon juice. Arrange the slices around the tart as pictured in the whipped cream.